Established in 1895 as a warehouse for the spice trade, 481 Washington was built to last. With its 25-inch-thick base and enchanting Beaux Arts facade, this regal structure later housed a thriving Hudson Square printing company. After an impeccable renovation, the magnificent loft building’s original arched windows and exquisite cornice remain a testament to the grandeur of days past. Perfectly anchored between Soho and Tribeca, Spice Warehouse has been converted into 12 spacious full-floor lofts that seamlessly fuse old-world character with modern convenience. Steps from the Hudson River, Spice Warehouse is within walking distance of renowned restaurants, famed art galleries, specialty shops and boutiques. With its golden sunsets and outstanding facilities, this is the ideal destination for those seeking the tranquil pleasures of the Hudson River waterfront. Expansive private floor residences were designed to be both versatile and functional, each with 3- to 4-bedrooms, 3 full baths, and a home office. Several residences enjoy dramatic Hudson River views. This open space has been designed to accommodate a perfect Tribeca city lifestyle for entertaining, relaxing and working. This living room design reflects a tailored “old-world” look, respecting the original features of the Spice Warehouse. With its high ceilings, arched windows, original brick wall and iron columns, this space is a testament of ancient time and old world elegance. The design choices are a combination of neutral, modern finishes such as the Oak natural matte finish floors and white walls, white shaker style kitchen cabinets, combined with a lot of texture found in the brick wall, the iron columns and the various fabrics and furniture pieces finishes used throughout the space and highlighted by a beautiful natural light brought in through a wall of arched windows. The layout is open and flowing to keep the feel of grandeur of the space so each piece and design finish can be admired individually. As soon as you enter, a comfortable Eames lounge chair invites you in, giving her back to a solid brick wall adorned by the “cappuccino” art photography piece by Francis Augustine and surrounded by flowing linen taupe window drapes and a shiny cowhide rug. The cream linen sectional sofa takes center stage, with its sea of textures pillows, giving it character, comfort and uniqueness. The living room combines modern lines such as the Hans Wegner Shell chairs in walnut and black fabric with rustic elements such as this one of a kind Indonesian antique coffee table, giant iron antique wall clock and hand made jute rug which set the old world tone for an exceptional interior. Where did you find such gorgeous columns? - Are these reuse center items, or actually available somewhere. Really lovely. Thanks! i would also like to know the answer to this question??? if anyone has heard. While I am not sure where the designer located these specific columns, often a great resource is your local salvage store or junk yard. 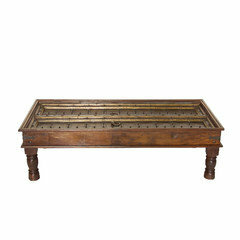 They often carry pieces like this for sale, that is where I would suggest starting your search. Hope this helps! Happy decorating! Thank you for your kind words about my design work. I am very pleased to have been an inspiration to your beautiful work. Congratulations on your cabin design! You did a fabulous job! It is tasteful, well planned out and with the right balance of yin and yang, texture, light and dark colors and even a bit of sparkles! Wishing you to enjoy it for many years to come! I ablsolutely LOVE all the pillows! Do you shop for them at a certain site online or?? I just bought a sectional that looks more cream/Brown and my walls are gray. I want to pull the gray to the couch and am looking for the Perfect pillows!! I own the same table. I purchased mine from Nadu Furniture with Soul. What a Wonderful room Marie Burgos Design ! 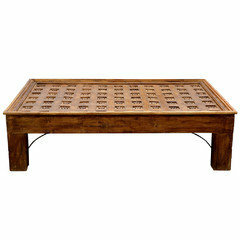 These coffee tables are custom made usually using antique doors or windows as a top insert . Please let us know if you are looking for a similar piece as we currently have a couple of them in stock but they are rare finds. This space is an ancient Spice warehouse. The columns are original iron columns which were refinished and repainted with a metal paint. 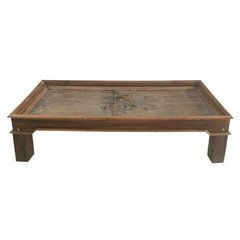 The coffee table looks like an old Indian daybed table. We carry them and have seen them at other shops as well. Hope that helps you find one! Where can I get the rug? I love this room! Favorite part: the amazing mix of neutral pillows on the sofa. Neutral done AMAZING! Great Columns - Can you direct me to where I can find these or some like them please. Try searching for an architectural store. We carry columns and occasionally see them at other shops. Where did you get the pulley light over diningroom table please? This is a Restoration Hardware ceiling fixture. Great Chairs! Where are they from? Where are the chairs from? gorgeous! Antler candle sticks - Are these antler candlesticks on the dining table? If so, I'd like to know where I can purchase these. This is a beautiful area, by the way. Thank you so much Louise for your nice comment. You can purchase those candlesticks at Arhaus, hope they still carried by the store! Same layout for our new home - What are the dimensions of the combined living/dining space? The dimension of the living and dinning space combined is 1700 square feet. Hope this was helpful and we wish you good luck with your design project! Beams - Are those the support beams of the house? They are real structural beams which were in place when the building was a spice warehouse. It has been transformed in beautiful residential lofts. We kept some original features as a reminder of the old spice warehouse it was, such as these iron columns which we have refinished or brick walls in some areas. The beams have actually been redone for safety but they are reclaim wood. love the end tables. Where are they from? These beautiful side tables are from Ballard Design and called the Bornova side tables. Best wishes with your design project! It is a natural oak. No stain. Paint Colors - What color and brand are the walls in this room. It is such a soft white! Stunning couch - Please tell me the manufacturer! Love, love, it! tile and cabinet color - What is the backsplash tile in kitchen and cabinet color please? I love everything about this space. - Looking for two chairs for an old antique dining table we recently refinished. The ones pictured at your dining table would work fabulously! Can you give me the manufacturer and style/fabric color? THANK YOU. artwork in the dining room? where can i get that ? where are the lounge chairs from? Where can I find the couch? Is it leather? - Where can I find the couch? Is it leather? where did you get these end tables from? pendants - i love the pendants over the kitchen island. where are they from?